258 pages | 12 B/W Illus. The book is structured around three intersecting parts – Spaces, 'Identity'/hybridity, Knowledge – that broadly follow the trajectory of postcolonial studies since the late 1970s. It comprises ten main chapters, each of which is situated at the intersections of postcolonialism and critical human geography. In doing so, Postcolonialism develops three key arguments. First, that postcolonialism is best conceived as an intellectually creative and practical set of methodologies or approaches for critically engaging existing manifestations of power and exclusion in everyday life and in taken-as-given spaces. Second, that postcolonialism is, at its core, concerned with the politics of representation, both in terms of how people and space are represented, but also the politics surrounding who is able to represent themselves and on what/whose terms. Third, the book argues that postcolonialism itself is an inherently geographical intellectual enterprise, despite its origins in literary theory. 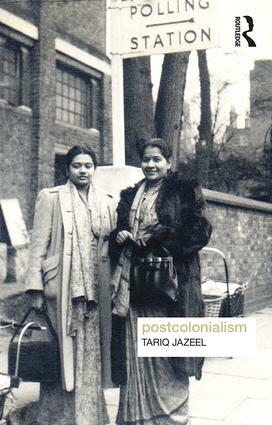 In developing these arguments and addressing a series of relevant and international case studies and examples throughout, Postcolonialism not only demonstrates the importance of postcolonial theory to the contemporary critical geographical imagination. It also argues that geographers have much to offer to continued theorizations and workings of postcolonial theory, politics and intellectual debates going forward. This is a book that brings critical analyses of the continued and omnipresent legacies of colonialism and imperialism to the heart of human geography, but also one that returns an avowedly critical geographical disposition to the core of interdisciplinary postcolonial studies. Tariq Jazeel teaches Human Geography at University College London in the UK, where he co-founded and co-directs UCL’s Centre for the Study of South Asia and the Indian Ocean World. His research is positioned at the intersection of critical geography, postcolonial and critical theory, and South Asian studies.